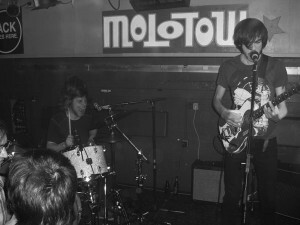 the belgian rock duo the blackbox revelation was at the molotow here in hamburg yesterday. they played one hour of powerful rock. the singer jan paternoster seemed pretty wasted but he showed a great performance right from the beginning and throughout the whole show. my room mate showed me a stunning video (first one below) of the blackbox revelation more than one year ago and since then i listend to their music regularly. But finally i was able to see them live. my most favourite song was “never alone / always together” (second video below).